Getting to grips with Instagram, and my frame has arrived! I’ve been trying to up my game on social media, I must admit it’s not really in my nature to do all this social media stuff, but I thought I could manage a daily photo or two on Instagram. I have been doing this for 2 weeks now, I’ve gained a lot of followers but soon found following everyone back just caused chaos in my feed as I can’t find the people who I like to see whilst having my coffee. I have shared my Instagram posts onto my Facebook page, ( which I thought was a good thing as FB no longer allow you to post on your personal page from places like WordPress). My insights tell me my reach is up and so is engagement so maybe sharing is a good thing, so long as I’m not boring people and looking spammy. Twitter doesn’t share your photo, only the Instagram link, do people really click on links? Getting back to Instagram, in one week I was invited to 2 online galleries, one of which wanted me to pay for the privilege, the other seemed a bit iffy too. That old saying about if it seems to good to be true then it is, came to mind. I was also asked by 2 instagrammies if I wanted to buy followers, why? All this social media stuff is just not me, it’s wearing and it eats away at my precious time, so you may see a daily post from me but if you really want to know what I’m up to then my blog is the place to be. Having said that I like the immediacy of Instagram, maybe you only see an odd post, like a snapshot of my day, but later you would see the whole story on my blog. I think they work well together. Working on the Art Elements theme challenge, will show you at the end of the month. 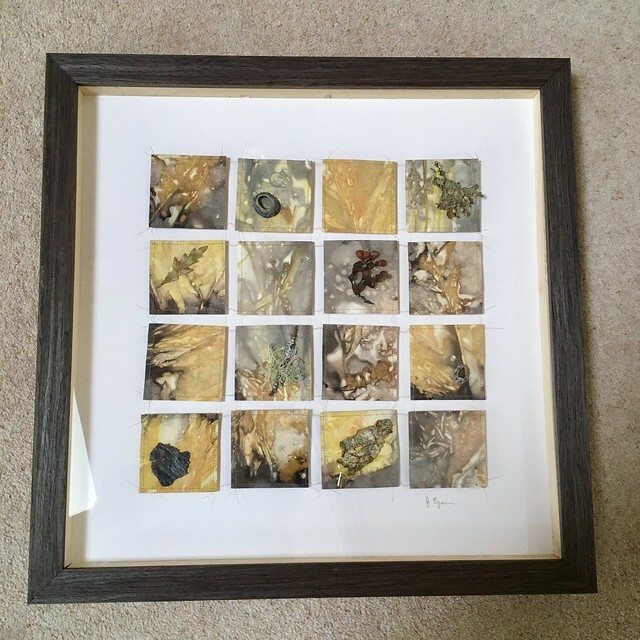 Also my frame arrived for ‘The Thread That Binds Us‘ mixed media artwork, I’m so pleased with this third or is it fourth frame, the colour is just perfect for the artwork, don’t you think? It’s not the best photo, it’s a dark brownish grey which really picks up the darks in the prints. Sticking down all those squares is a nightmare to get them lined up as the binding thread is not the same length everywhere, maybe that’s a metaphor on life. I have put a key on the back of the picture with an explanation for each square, plant type, where I found it, memories of the day etc. I love this piece very much but then it is full of memories, I think it’s become one of my most treasured possessions. You might have read about my struggle to find the right frame, let me know what you think, did I make the right choice? This entry was posted in eco printing, kiln fired art and tagged Anniversary artwork, eco printing, instagram, kiln fired art, memory art, mixed media art, The Thread That Binds Us, unique memories art. Bookmark the permalink. 8 Responses to Getting to grips with Instagram, and my frame has arrived! I so agree!!! Instagram is fabulous but you follow random people and very soon it is overwhelming with posts that really you are not interested in and it eats your time! I have been ruthless and now only have those I like and follow with interest – yours is one of them ;). I love that frame and you have just given me the inspiration for my piece for the Art Elements challenge!! It’s beautiful Jill – and the frame is perfect for it, not surprised it has become so beloved. I agree with your thoughts about Instagram. The problem I’ve been having is that random people’s posts (a lot!!) show up and when I click to ‘hide’, it appears that I’m following them!!! So after some googling I found out that based on some 3rd Party App I may have given access to my phone to for some unrelated reason, these show up. But I still can’t figure out WHY I have to Unfollow when I never followed them in the first place!! So, I did what they say to do for this type of 3rd Party thing and haven’t added any apps since, and I’m still getting peeps …. go figure. Oh … the frame is THE perfect choice!! Oh Alysen that sound like a right pain. Thanks for the heads up, I will be wary of 3rd party apps. I hope you get it sorted.